Can you confirm these amateur observations of Chrysemys dorsalis? 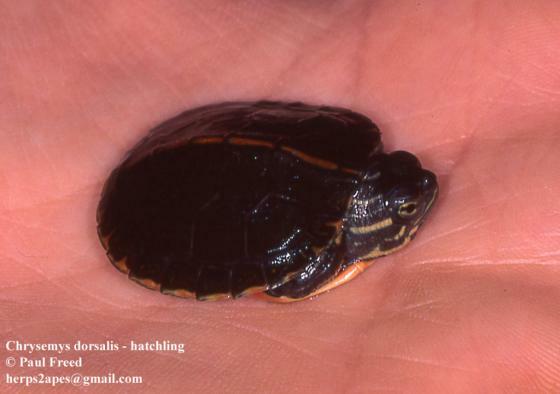 Type locality: vicinity of New Orleans, Louisiana (restricted by K.P. SCHMIDT 1953). Comment Taxonomy: STARKEY et al. (2003) suggested to elevate C. p. dorsalis to full species status. These authors also questioned the validity of the other subspecies. Because morphological intermediate specimens are known between C. dorsalis and C. p. picta, C. p. marginata, and C. p. bellii (Ernst, 1967, 1970, and others), the taxonomy of dorsalis is debatable (Reynolds et al. 2007, TTWG 2012). 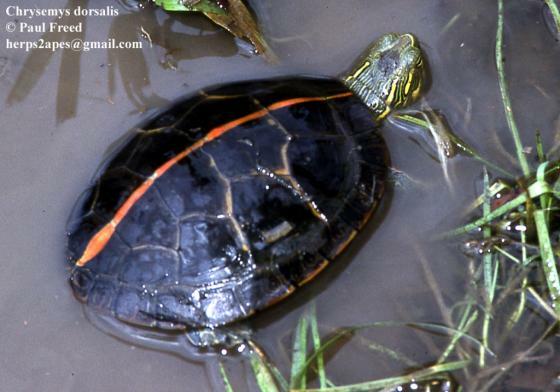 Etymology Named after the prominent middorsal stripe on the carapace (the “dorsum”). Agassiz, Louis 1857. Contributions to the Natural History of the United States of America. vol. 1. Little, Brown & Co., Boston, lii + 452 pp. Degenhardt, William G.; C. W. Painter, and A. H. Price 1996. Amphibians and reptiles of New Mexico. Univ. New Mexico Press, 431 pp. Dixon, James R. 2000. Amphibians and reptiles of Texas, second edition. Texas A&M University Press, 421 pp. Elmberg, J. 1980. Herpetological observations 77-78 [in Vernon county, Wisconsin]. Fältbiologerna Umea. Green, N.B., & Pauley, T.K. 1987. Amphibians and reptiles in West Virginia. Univ. of Pittsburgh Press, Pittsburgh, 241 pp. Hibbitts, Troy D. and Terry L. Hibbitts 2016. Texas Turtles & Crocodilians: a Field Guide. University of Texas Press, Austin, Texas. xvi + 276 pp., 117 photos, 36 maps. ISBN 978-1477307779. Hunter, M.L., Jr., Albright, J., & Arbuckle, J., eds. 1992. The amphibians and reptiles of Maine. Maine Agric. Experiment Station, Orono, Bull. 838 188 pp. Lever,C. 2003. Naturalized reptiles and amphibians of the world. Oxford University Press, 338 pp. Mitchell, J.C. 1994. The reptiles of Virginia. Virginia Department of Game and Inland Fisheries, ca. 350 pp. Schneider, J. G. 1783. Allgemeine Naturgeschichte der Schildkröten, nebst einem Systematischen Verseichnisse der einzelnen Arten. Müller, Leipzig. xlviii + 364 p.